This past weekend my family went to a German restaurant to celebrate my oldest sister’s birthday. That morning, my Evans’ order arrived, so it felt like fate that I was supposed to wear my new purchases out, even though I was a little worried that I’d be overdressed. I often overdress for a night out with my family because most North Carolinian’s are pretty laid back and casual in their dress. Luckily for me, everyone seemed to have dressed up a bit so I didn’t feel too glitzy. My brother even put on his special plain-gray “Holiday” sweater (his only piece of clothing without a hole in it). I fell in love with this Evans Collection top pretty much instantly. It has the perfect weight of fabric, and I am into high necklines lately. 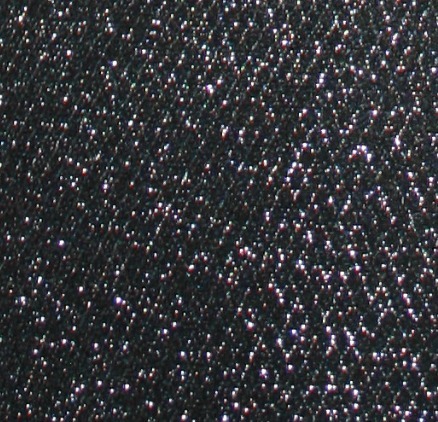 The fabric is really beautiful with tiny diamond shapes of metallic thread. It has a line in the fabric where I put the belt because it is a peplum top, but I added a belt to enhance the shape since a peplum tends to not look very peplum-y on me. I may have gone a little metallics overload with the necklace and the bracelet. I think next time I wear this I’m going to go with bright , rich colors like an electric blue or deep red jewelry. The shirt is not actually as overwhelming in shine like these pictures make it seem. Below is a slightly blurry non-flash picture that shows what the top looks like to your eye. I had ordered some other items from the Evans Collection that I am returning because of fit issues, but this piece really stood out in terms of quality and design. I’m sure I’ll be wearing this all throughout this holiday season. What do you think: Metallic overload or just enough? Not overload at all. I love it! Yay! Thanks Terry! I see your Project Runway commentary, so I trust your response :-). The only thing I feel is overloaded about this top is the price -wow! I love this top, tho – that’s not too much!!! It is expensive. I purchased it during a sale, but it was still up there in price. Not overload! I love this look, & I think the peplum cut, while it may not look peplum-y, is nice on you because it hits you in the right places & just makes the top look like it fits you really nicely. pretty, pretty! I love this top! I love the little belt you are wearing, if you don’t have too much of a waist, the belt helps accent the waist. I love the jewelry. I know about NC people, they are pretty laid back. 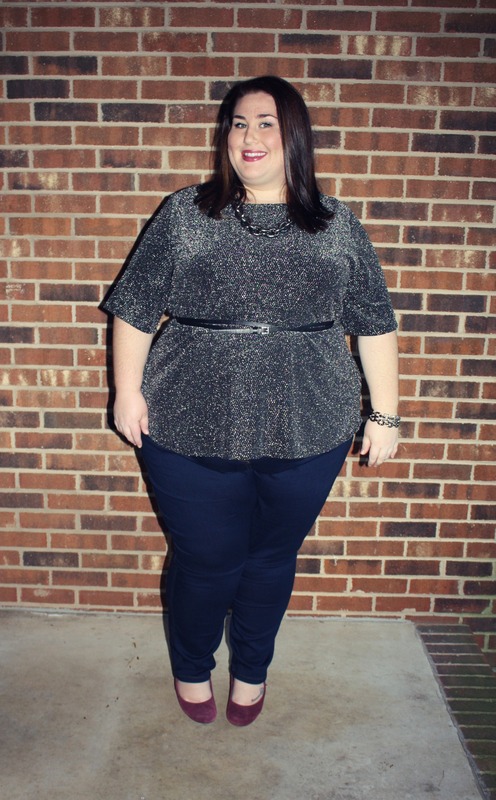 Definitely not metallic overload – you look fab! Hi! 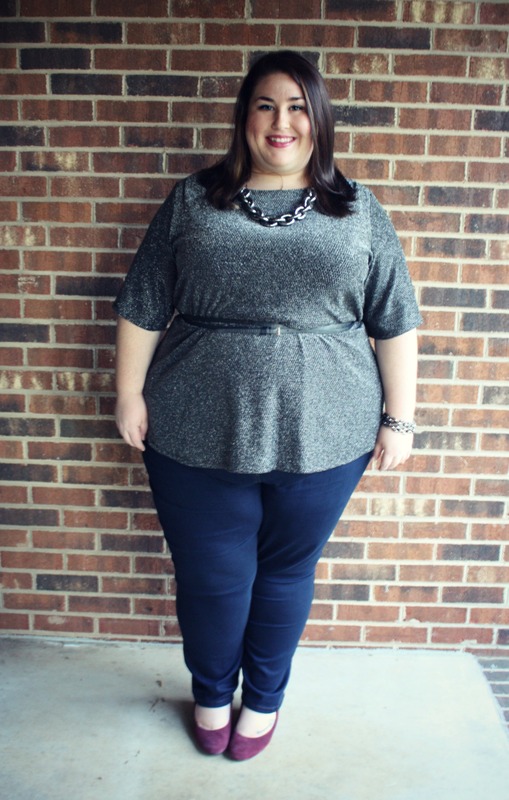 :) I’m so glad I discovered your blog.You have really great style and I really admire the fact that you don’t let your size control it. 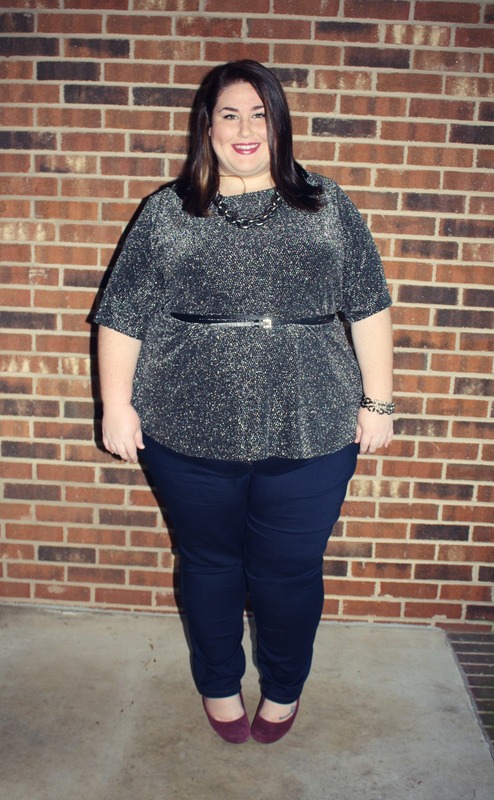 :)I know from personal experience that being plus size can be challenging when it comes to personal style. I’m following you on bloglovin and twitter and will be stopping by a lot. Thank you! I’ve followed you on Twitter. I just got an Evans order- I love everything! I went to a store when I was in Dublin last year and was so excited when they started to ship to the US. Oh! And I nominated you for the Very Inspiring Blog Award! Thank you very much!! I love most things I get from there. I know a lot of people who don’t care for Evans (which is my feelings toward Lane Bryant), but I’ve always been impressed, plus I can actually order a size up there, which isn’t the case for most stores! I ordered a size up. I was a bit afraid the clothes would run small. Next time I will order my regular size. The fit was good but a bit big. The only downside is the shipping- you never know when it will get to you. Yep, even the tracked and faster isn’t very reliable. I always make sure to order under $200 too because otherwise you get big customs fees.